September death toll for UK. 89 million, 928 thousand animals slaughtered. Media running pieces today about fox hunting in Scotland. This has been going on for many, many years and will continue until real action is taken. Strong legislation is needed but this still leaves the issue of enforcement. The behaviour of some elements within Police Scotland towards hunt monitors raises serious questions on their impartiality. If you want to stop these characters pressure your MSPs to not only change the law but ensure it’s properly applied. And support your local sab group. Umpteen empty promises later a public consultation on the Protection of Wild Mammals (Scotland) Act is apparently pending. This is the law that ‘banned’ fox hunting. If you want an example of grandstanding, but effectively unworkable legislation you need look no further. Some of the MSPs who let this shambles slip through are still in the chamber. Please get it right this time. Good to see some other Scottish animal organisations catching up with SfA and finally bringing themselves to support legislation for mandatory abattoir CCTV. It only took you how many years? Amazing how quickly some jump the wall when they see the wind changing direction. Don’t worry, we and the rest of the public have already handled all the hard graft. Better late than never though. Action is needed on unstunned slaughter. Now. The number of animals slaughtered without stunning has seen a massive rise. Scotland for Animals continues to lead the campaign to expose and end this scandal. We warned many years ago that unstunned slaughter was becoming one of the biggest welfare issues of our time but other organisations seem reluctant, to say the least, to tackle the issue. Welfare groups need to act, authorities need to act and politicians need to act. Now, before it’s too late. 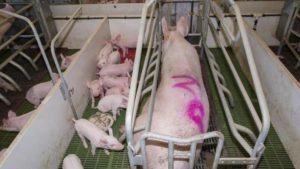 New report compiled by researchers from ETH Zürich, Princeton and the University of Cambridge expects use of antibiotics in animal farming to rise by another 52% by 2030. If you had any doubts the UK meat industry’s out of control here’s more miserable news. 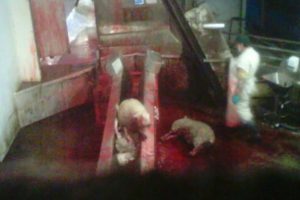 This is an example of why Scotland for Animals campaigns not only for mandatory abattoir CCTV but for any monitoring to include bodies independent of food operators and authorities. An almost unbelievable display of hypocrisy through week as Richard Lochhead MSP was spotted outside Holyrood joining campaigners calling for tougher sentencing for animal cruelty. Throughout his many years as Cabinet Secretary for Rural Affairs, Food and Environment Lochhead consistently blocked attempts to improve welfare in the meat industry from abattoir CCTV to a ban on unstunned slaughter. We shudder to think the suffering this character and his cohorts have enabled as a result. This is either a crisis of conscience or rank opportunism. Knowing Lochhead’s record we would suggest it’s the latter. Please don’t be sucked in by these con-artists.